The eighth and final new civ in Civilization VI’s next expansion, Gathering Storm, has been revealed. Dido is back and leads Phoenicia (not Carthage), and they’re a tribe of aggressive naval colonists. Dido’s leader ability is Founder of Carthage, through which she can move Phoenicia’s capital to any city with a Cothon. This is not only handy for moving your capital from Tyre to Carthage, but for moving your loyalty pressure to where it’s most effective. Dido gets an extra trade route for the Government Plaza district and each of its buildings, as well as +50% production towards all districts in the city where the Plaza is located. Phoenicia gets a unique district: the Cothon, which replaces the Harbour and can be built on any lake or coastal tile. It grants +50% production toward all naval units and settlers, and enables naval units within the local city’s borders to heal completely in a single turn. Phoenicia’s unique ability, Mediterranean Colonies, grants +2 movement and sight range to embarked settlers, and means that all coastal cities on the same continent as your capital will always be 100% loyal. Symoblising Phoenicia’s invention of the alphabet, they start with the Eureka moment for Writing. Phoenicia’s unique unit is the Bireme, a faster and stronger replacement for the galley in the Ancient era. Traders within four tiles of a Bireme cannot be plundered. We can assume a coastal start bias for Phoenicia, so you’ll want to beeline the naval techs to get Biremes and Cothons up early. Given this and your cheaper, faster, farseeing settlers, you should aim to scope out plum coastal sites for colonisation, and to feed them with fishing boats. You’re pretty much obligated to do this if you want to make the most of your uniques, but it might leave you vulnerable to a landborne expansionist, so don’t settle your cities too far away to reinforce one another. Phoenicia’s early game should be interesting and look very different from anyone else’s, clustering around water rather than land. Phoenicia will clearly dominate an archipelago map thanks to the Cothon, while the Government Plaza’s bonuses to districts and trade routes are very welcome and universally helpful. Get some rich coastal cities going early and you set yourself up well. Civ 6: Gathering Storm is barely more than two weeks away now – it’s due to launch on February 14. 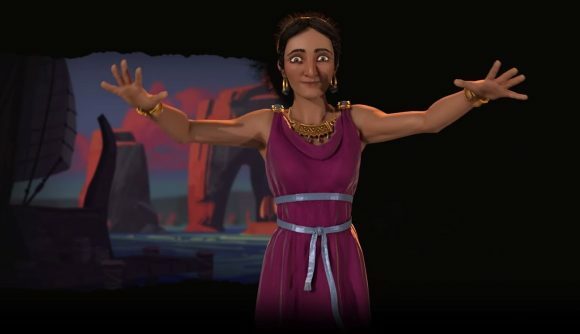 Phoenicia is the last civ to be revealed, but we’re still expecting to hear about a ninth new leader.